I don’t make pizza nearly as often as I’d like. We all love pizza, but my husband tends to be a bit of a pizza snob. His pizza tastes are very particular and usually only met by one of a handful of local pizza places. He enjoys pizza when I make it from scratch, but it’s just not the same. However, I think tonight’s pizza may have finally changed his mind. The crust has always been the issue with homemade pizzas. This crust turned out to be the perfect blend of taste and crispiness though. We all agreed that I should definitely add this to a regular, twice a month rotation. That is exciting for me! The barbecue chicken pizza toppings were a hit too, although they weren’t nearly as important as that crust. 1. Let yeast and sugar dissolve in warm water in a large mixing bowl for about 5 minutes. Add olive oil, salt and optional Italian seasoning. Slowly add the flour until completely combined and dough is no longer sticky. (I used just over 4 cups of flour to get to that point.) Knead for 5 minutes, place in a greased bowl, cover and let rise for 1 hour. *Depending on how thin you like your crust, this makes enough for 2 large pizzas plus 2 small pizzas. The extra dough can be frozen. Add everything to a small bowl and stir until combined. Refrigerate at least 30 minutes before using to allow the flavors to blend. 1. Roll out dough into desired sizes on thickness. Place on a baking sheet or stone dusted with cornmeal. 2. 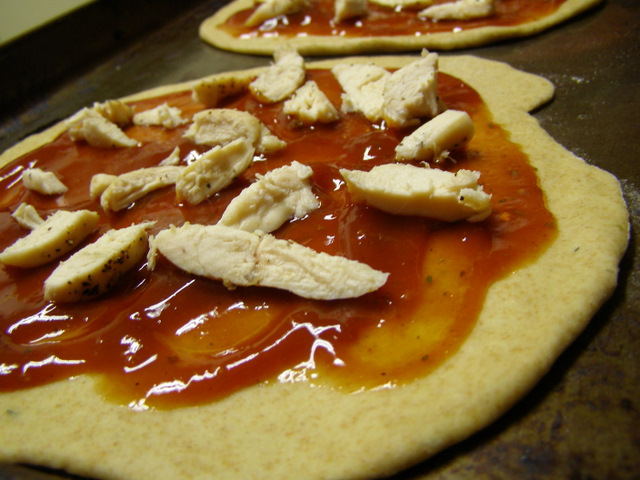 Spread barbecue sauce on top of the crust, leaving about 1/2 inch crust all the way around. 3. 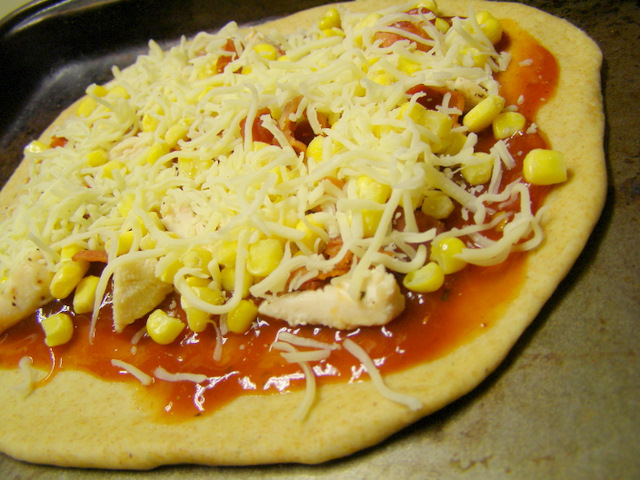 Top with chicken, any other desired toppings and cheese. Bake at 500 degrees for 12-15 minutes, until crust is golden brown. For our pizzas, I set out all the toppings in little bowls and let everyone select what they wanted. I made two small pizzas for the kids and one large one for my husband and I to split. Ok my mouth is watering. i just might try this recipe really soon! You can grab a big pizza offer Buy One Get One Pizza Free at Bellacino’s Pizza and Grinder. That looks delicious. I know my family would love it! Thanks for sharing the recipe. 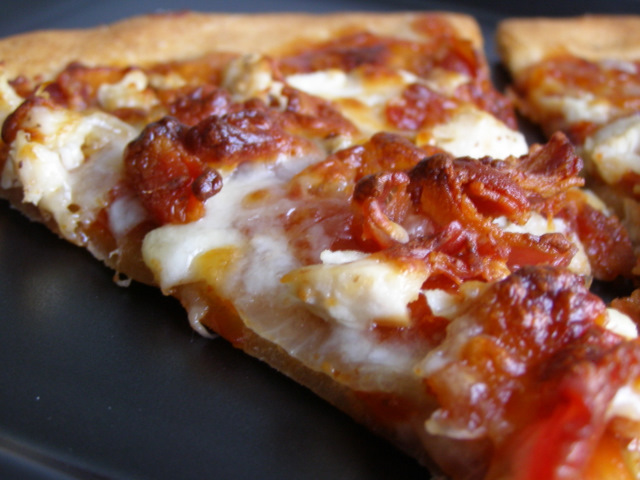 This is one of our favorite homemade pizza toppings! We just use bottled sauce since we have a ton of it free. Ohhh this looks yummy!!! Might have to give this a try! I am so glad to hear that my hubby isn’t the only bit of a pizza snob. 🙂 My hubby loves my homemade pizza but is always complaining that it is salty. Haven’t quite figure it out either as to what is making it salty to him because the rest of us don’t think so. PS Try grilling your chicken and/or grilling with the sauce for extra flavor. My husband and I love the California Pizza Kitchen frozen BBQ chicken pizza, and also the one at the Ultimate California Pizza restaurant. I’ve made my own version, which was similar to yours, but sometimes I add a combination of cilantro, pineapple and/ or garlic. It’s great no matter how you do it! The corn is a unique idea to add though, sounds great! At what point do you freeze the dough – after rising, before? Seriously I cannot thank you enough for this recipe. I have been trying and trying pizza recipes (as you have I am sure) and this IS IT! 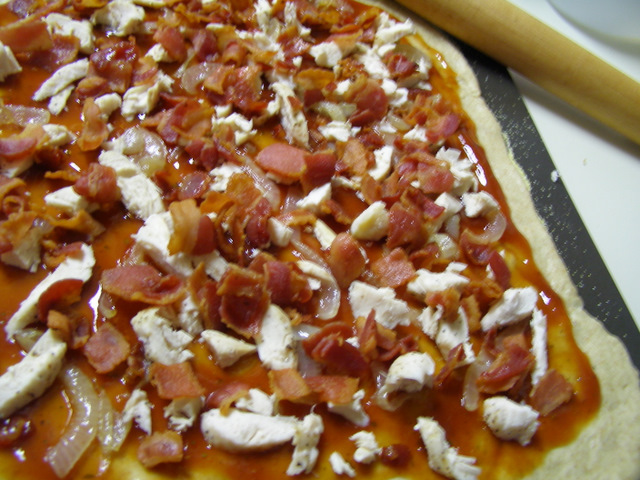 I made my own BBQ chicken pizza with this crust is THE BEST HOMEMADE CRUST YET! I loved it. My son (who is very picky) could not stop eating the pizza. Thank you so much for posting this. I actually did it in my bread maker and it still turned out wonderfully! 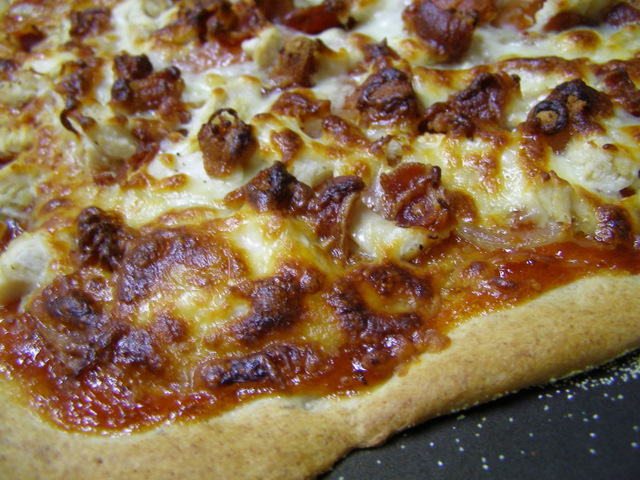 I agree with your Barbecue Chicken Pizza â€” Cooking During Stolen Moments, great post. What a fantastic post, how can I make is so that I receive an email sent to me when you write a fresh post?